In 2004, she finished the season as a top 100 player. As a qualifier at only her third Tour main draw at inaugural Vancouver, Vaidišová became the sixth-youngest singles champion in Tour history at 15 years, three months, 23 days of age, and the lowest-ranked player (No. 180) and second qualifier (of three) to win a title in 2004. She won her second title of the year at Tashkent, defeating Virginie Razzano in the final. On October 18, she made her Top 100 début at No. 74, becoming the youngest player in the top 100 at the time. Later in the season, she reached the quarterfinals at the Japanese Open in Tokyo, defeating No. 29 Tatiana Golovin in three sets en route for her career-best win, before losing to Klara Koukalova. Vaidišová made her Grand Slam début at the US Open losing to defending champion and world No.1 Justine Henin-Hardenne 6-1 6-4 in the first round after leading 4-1 second set. She won ITF/Columbus, OH-USA at the start of the season and reached her then career-high No. 72 singles ranking on November 1. Apart from the success in senior competitions, she was also a finalist of a girls' competition in Australian Open that year. She lost to Shahar Pe'er in the final. 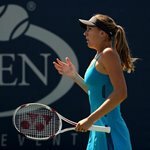 Despite being only 14-years-old, she finished the year with two WTA titles and a win-loss record of 31-8.